SCHOFIELD BARRACKS (August 30, 2017) – Andrew Gomes of Kapolei was presented the Civil Air Patrol’s highest cadet honor in a ceremony held at Schofield Barracks on Wednesday night. 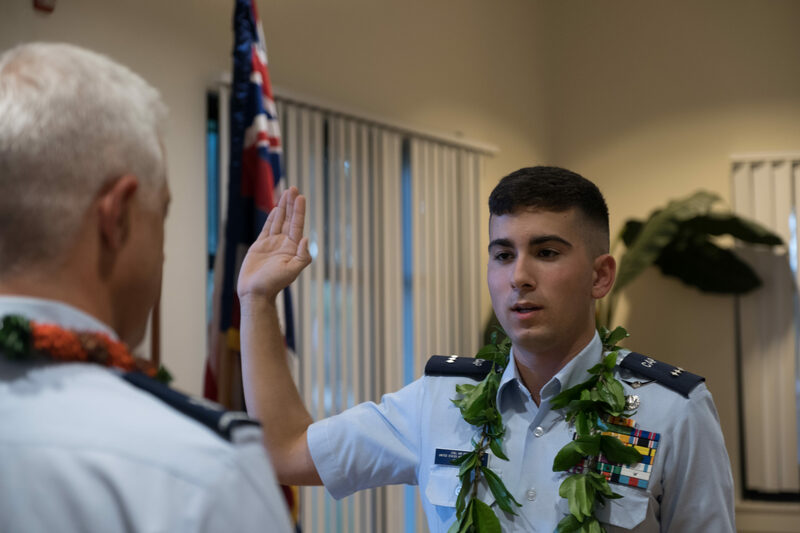 The 17-year-old cadet is the 14th in Hawaii’s history to receive the prestigious General Carl A. Spaatz Award, having demonstrated excellence in all aspects of cadet life: leadership, character, fitness, and aerospace education. Only five cadets in a thousand earn the Spaatz award. Only 2,125 cadets, including Cadet Colonel Gomes, have been presented the award throughout the nation since the award’s inception in 1964. Cadet Gomes is a member of Wheeler Composite Squadron, where he serves as Cadet Advisor. The Hawaii Wing of the Civil Air Patrol consists of ten squadrons located across the island chain. Cadets from these squadrons serve not only at the local squadron level but also at the higher Wing level. Cadet Gomes has held several major leadership positions at the Wing level, most recently as the Cadet Training Group Commander for Hawaii Wing’s 2017 Cadet Encampment this past summer. His contributions to both the Wing and squadron levels have been recognized with several awards, and he has also represented Hawaii Wing at National events on the mainland. Qualified as a solo pilot of powered aircraft through the Civil Air Patrol, Cadet Gomes is also a member of the Marine Corps JROTC unit at Kapolei High School, where he serves as Company Executive Officer. To be eligible for the Spaatz Award, cadets spend an average of five years working their way through sixteen levels of achievement within the cadet program. Self-discipline, a strong sense of personal responsibility, the ability to lead, and the foundation required for pursuing aviation, space, and technology careers are developed through the cadet program. Earning the Spaatz award requires passing a rigorous four-part exam testing fitness, moral reasoning, leadership knowledge, and aerospace education. Those who pass are promoted to the grade of Cadet Colonel. As a recipient of the Spaatz Award, Cadet Colonel Gomes will continue to serve as a role model for junior cadets and further prepare to be a leader within the larger community.